For some, Wednesday's celebration of St. Patrick warrants a holy day of obligation. For many others, St. Patrick's Day is a time for green clothing and excessive drinking. Page 2 decided the best way to honor St. Patrick's work was to compile an Irish-themed list of sports figures. Boston Celtics: A winking, dexterous leprechaun symbolizes six decades of tradition and the most championships of any NBA franchise (17). The Celtics are also the only team with a traveling player-mascot, Brian Scalabrine. James Braddock, world heavyweight champion boxer: "The Cinderella Man" had early dreams of playing football at Notre Dame, but certainly embodied the "fighting Irish" in the ring, defeating a heavily favored Max Baer in one of the greatest upsets in boxing history. John Daly, professional golfer: He wears bright green argyle pants and can tee off a beer can. His next feat? Putting with a Guinness bottle. Elsa/Getty Images Jonathan Papelbon dances an Irish jig as the Dropkick Murphys play during the Boston Red Sox's World Series victory celebration in 2007. 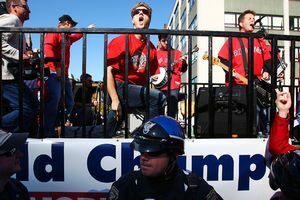 Dropkick Murphys, Celtic punk band: Their Red Sox and Bruins fanhood may score points with Bostonians, but it's their hit "I'm Shipping Up to Boston" that lands them on this list. The hard-hitting Irish jam can be heard in stadiums throughout the country and, more importantly, evokes images of Jonathan Papelbon dancing an Irish jig in long underwear. Emerald Bowl: If you're not a college football fan, you may be envisioning green pastures. If you are a college football fan, you may be envisioning AT&T Park hosting two mediocre teams in a game sponsored by a brand of nuts. Dan Harrington, former World Series of Poker champion: He's after your lucky charms and always wears a green Red Sox cap at the table. Joey Harrington, former NFL quarterback: Green or no green, anyone who bought into "Joey Heisman" needs to be pinched. Padraig Harrington, professional golfer: Padraig is the Irish version of the name Patrick. Oh, and he's from Ireland and actually really good at his sport. Boring, we know. Kathy Ireland, swimsuit model: She's the Roger Federer of her craft, having appeared in the Sports Illustrated swimsuit edition 13 consecutive years. Roy Keane, Irish soccer player: Keane captained Manchester United to the Premier League championship, FA Cup and UEFA Champions League title in 1998-99. He's also famous for his fiery temper, as he was sent home from the 2002 World Cup after calling his coach a "wanker," among other things. John McEnroe, former world No. 1 tennis player: Ever heard the phrase "Irish temper"? Mark McGwire, 12-time MLB All-Star: We're not here to talk about the past. We're here to be positive. And McGwire tests positive for Irish genes. George Mitchell, special envoy to the Middle East: In addition to leading baseball's investigation into performance-enhancing drugs, the former senator from Maine was heavily involved in the Northern Ireland peace process, serving as the U.S. special envoy for that region from 1995 to 2000. 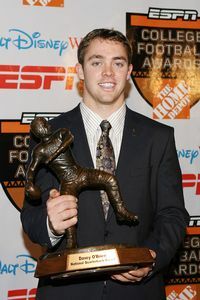 Doug Benc/Getty Images If Colt McCoy holding the Davey O'Brien Award isn't somehow Irish, at least it sounds like it is. Tom Monaghan, founder of Domino's Pizza: Pizza has Neapolitan roots, but Monaghan has Irish parents. Monaghan owned the Detroit Tigers when they won the 1984 World Series and he sold Domino's in 1998. Notre Dame Fighting Irish: Notre Dame competed under the nickname "Catholics" during the 1800s and arrived at the "Fighting Irish" moniker in the 1920s, largely as a joke. Guess it hadn't seen "Rudy." Danica Patrick, IndyCar and stock car driver: Rumor has it her sponsor is considering officially changing the Gaelic phrase "Erin Go Bragh" to "Erin GoDaddy." Digger Phelps, ESPN analyst: The former Notre Dame basketball coach is known for breaking it down on "College GameDay," and he shows off his Irish jig when he hits the court with cheerleaders. Patrick James Riley, Miami Heat president: The slicked-back hair is key for the man who won four NBA titles as coach of the Lakers; he easily could pass for one of Frank Costello's hit men in "The Departed." Saint Mary's Gaels: The team mascot is another name for a Gaelic-speaking Celt, and Saint Mary's men's basketball team earned a ticket to this year's Big Dance by defeating Gonzaga in the WCC tournament. The high scorer? Mickey McConnell. Ken Shamrock, MMA fighter: His nickname is The World's Most Dangerous Man, and one of his finishing moves is called the guillotine choke. You want to challenge his spot on this list? Be our guest. St. Vincent-St. Mary High School, LeBron James' alma mater: "The Chosen One" led this private Catholic school in Akron, Ohio, to three state championships, all while rocking a Fighting Irish uniform and being chronicled in the school newspaper, "The Leprechaun Gold." Toronto St. Patricks: The Toronto Maple Leafs were known as the St. Patricks from 1919 and '26 and won the Stanley Cup in 1922. Kaitee Daley is an editor for ESPN.com. Andrew Astleford, Gerry Brown, Shane Igoe, Sean Kleier, Thomas Neumann, Scott Rogowsky, and Adam Watson contributed to this article.